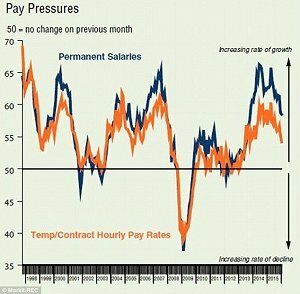 UK starting salaries and pay rates for new permanent and temporary jobs rose in January at the slowest pace since October 2013, according to results from a survey conducted by the Recruitment and Employment Confederation (REC). The Markit/REC Report on Jobs was published today and provides a comprehensive guide to the UK Labour market, with data provided by recruitment consultancies nationwide. However, demand for permanent staff continued to increase at a faster pace than that for contract workers, which rose at the slowest pace for four months. There is also a further increase in vacancies, signalling a stronger demand for staff. However, candidate availability for both temporary and permanent roles continued to decline in January, albeit at a slower rate than the previous twelve months for permanent staff and three months for contract staff. Demand for staff remained stronger in the private sector than the public sector during January. The strongest overall increase was signalled for private sector permanent workers. Public sector permanent staff saw only a marginal rise in vacancies, although this was an improvement on the falls seen in the final two months of 2015. Nursing/medical/care was the most in-demand category for permanent staff during January. The second-fastest increase was signalled for executive/professional workers. Hotel and catering posted the slowest growth. Demand rose for seven of the nine monitored types of temporary/contract staff during January. The fastest growth was signalled for Blue Collar workers. Construction and hotel and catering saw marginal declines in the latest month. REC chief executive Kevin Green said: “The jobs market has started 2016 with a bang – our latest data shows strong growth in demand for staff and in permanent placements. Professional service jobs are among those leading the way, with marketing and commercial roles especially in demand as businesses seek to make the most of the good economic climate. “It’s not all good news. Organisations in sectors such as construction and manufacturing are finding it increasingly difficult to recruit due to entrenched skill shortages. The healthcare sector is also a source of concern. A severe shortage of nurses is being exacerbated by the government cutting pay for temporary doctors and nurses. We believe that patient safety may be compromised as some NHS trusts struggle to staff wards.